ALGERNON BLACKWOOD Typed Letter Signed. British (English) short story writer and novelist, noted for his ghost stories. TLS. 1p. Savile Club, 69 Brook Street, W.1. October 31st 1929. To [Arthur] St John Adcock. "I enclose the article you suggested and hope it will suit you. As I have now been photographed by Howard Coster, I wonder if you would kindly return the snap-shot I sent you some ten days ago. Yours sincerely, Algernon Blackwood." 8vo. Approx 8 x 5 inches (20 x 13 cms). Some creasing and slight marking. Small chip and pinhole to top edge. Mounting traces to verso. All else VG. Algernon Blackwood was one of the most accomplished and consistently excellent of ghost story writers. His 1914 collection of stories 'Incredible Adventures' has been hailed as perhaps the most perfect collection of ghost stories ever written. 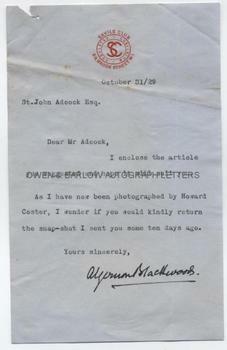 Algernon Blackwood was also a prolific contributor of essays and other material for periodicals and it is probably in this connection that he is here writing to Arthur St John Adcock, who, for many years was sole editor of 'The Bookman'.